When I first got behind the wheel of my fully electric Tesla Model S, the 17″ multi-touch console display immediately got me thinking about the plethora of cool apps that it could enable. 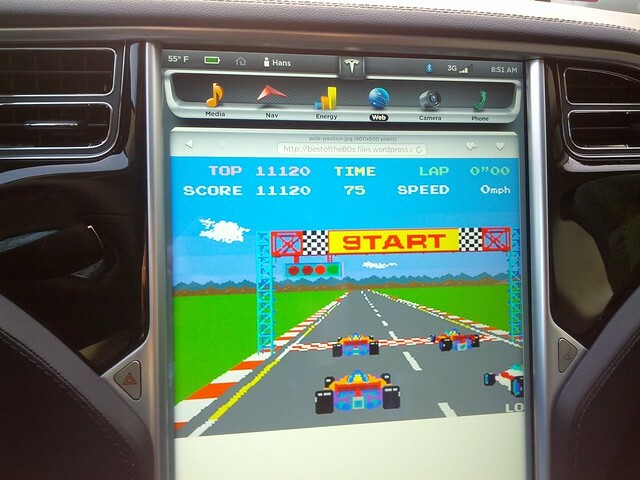 Imagine porting MAME and running classic video games like Atari’s Pole Position using the actual steering wheel and pedals as the drive-by-wire controls. More practically, imagine using the onboard GPS to define geocoded zones that dynamically adjust the height of the Active Air Suspension to avoid scraping speed bumps and ditches that would otherwise fail to clear the front spoiler or the underlying battery pack. I would love to have the Android app Torque Pro running on the console and streaming real-time telemetry from the onboard computer to a cloud hosted application for post-race — sorry post commute — analytics. I’ll let you know how that goes in a later post. I’m still waiting for Tesla to release the native SDK for this platform, but in the meantime there’s a lot you can do via the embedded browser which I’ve discovered does support HTML5 WebSockets. For fun I tried a few of the Solace Web Messaging demos and as you can see in this video they work fine. What this says to me is that the WebSocket protocol is essentially becoming ubiquitous and you can add cars to the ever expanding list of the Internet of Things.